I briefly mentioned this lip gloss as the one I used for my Wedding face of the day post a couple of weeks ago. I thought I would come back to it now to share my thoughts. Well, my thoughts are pretty simple. 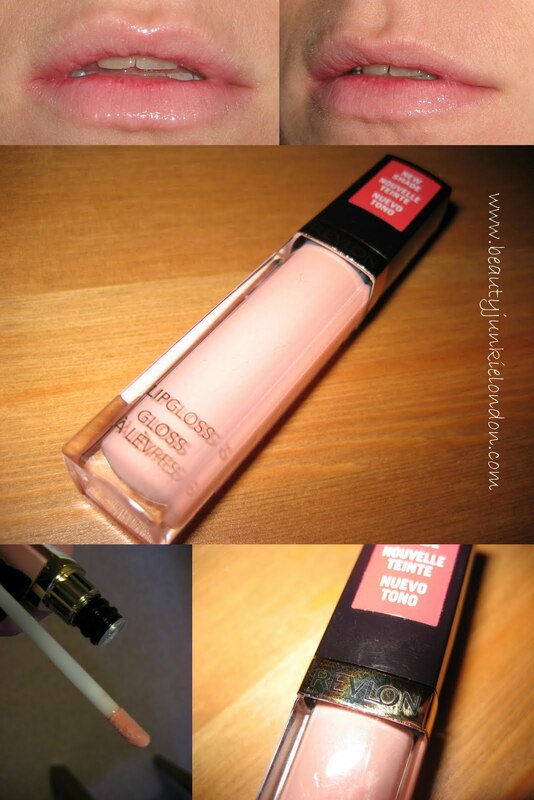 This is a lovely lip gloss, non-sticky, light texture with no glitter and an easy to wear colour. If you like pale pink lips this is a colour you need. Creamy and non-drying there isn’t anything bad to say about it. Honestly, I’m trying to think of something to niggle about, but I truly can’t think of anything. It doesn’t smell bad, feel tacky or vanish in seconds. I really like this shade – peach petal – in fact, I like it almost as much as I liked the Korres Gloss I recently reviewed. This is the second gloss I have tried from Revlon (the other being Lilac Pastelle) and I really like the formula of both – but I do prefer this colour over the lilac, this one is a touch easier to wear. So what do you think of pale lips? I think it’s one of the make-up looks that seems to split peoples opinions – some love it, others hate it. Personally I like pale lips, I think it looks polished but not over done – but I’m not a fan of the concealer lips look. Tell me what you think about pale lips – love or hate??? This product was provided free of charge for review purposes. i like pale lips but only when it’s done right. i.e. if your skin is orange due to fake tanning, there is pretty much NO pale lip you can pull off. however, this type of pale lip is gorgeous! revlon’s lip products seem to be getting a lot of raves lately, i really should go check them out. I just saw this on another blog and fell in love with it, and now you’re just making me want it more! This is very pretty! Nice and natural. I love this type of colours too. I’ll definitely check it out! I looooooooove this lip gloess, the colour reminds me of the GOSH lip gloss I have (cool jam 102 I think) but I have a few of the cool jam glosses and find they are a bit “sticky”…so I may have to give this revlon one a try! !